For those who prefer videos ... a CLASSIC from Channel 4's Dispatches. So much for sanctions under UC ? No evidence that benefit sanctions work, finds secret DWP report. Government accused of ‘sneaking out’ report that signals failings in universal credit rollout. Frank Field, chair of the Work and Pensions Committee, accused ministers of trying to bury the findings rather than give parliament the chance to debate how to better help low-paid workers. “Rather than set out a bold plan to help low-paid workers earn more money – with more direct support being offered as opposed to terrifying the life out of them with the threat of sanctions – the DWP has decided to sneak out this report without giving the House of Commons an opportunity to debate its contents or the actions that are required on the back of it,” he said. “Under universal credit, sanctions are being used for the first time ever against low-paid workers as a means of pushing them to increase their hours or move jobs. The ongoing universal credit rollout will see three million people currently receiving tax credits and disability benefits moved on to universal credit from next April. Mr Field said if universal credit were to be built into a “line of defence against poverty, rather than an agent in its creation”, a more careful application of sanctions would require “urgent attention”. It comes after a major report from the UK’s biggest food bank network found the rollout of universal credit would trigger an explosion in food bank use, with data showing that moving onto the new welfare support was the fastest growing cause of food bank referrals. The Trussell Trust said urgent changes to the new welfare system were needed to protect vulnerable claimants from falling into hardship or dropping out of the benefit system altogether. Garry Lemon, director of policy at the Trussell Trust, said: “We owe it to ourselves to have a benefits system that gives us support when we need it most, and ensures everyone has enough money to afford the absolute essentials. “Yet our research shows that the more people are sanctioned, the more they need foodbanks. On top of this, government’s own research shows that sanctioning under universal credit has no effect in encouraging people to progress in work. Margaret Greenwood, Labour’s shadow work and pensions secretary, said it was “shocking” that the government was sanctioning working people who are “just trying to do the right thing”. She said: “This report shows that there is no evidence that sanctioning helps people increase their earnings. Meanwhile, wages are still below 2008 levels and millions of people are stuck in insecure work. The benefit sanctions system has long been fiercely criticised for causing hardship and depression, often on flimsy evidence of wrongdoing – and with little proof that they work. In a damning report in 2016, the National Audit Office castigated the DWP for failing to monitor people whose benefits had been docked and suggested the system cost more money than it saved. A DWP spokesperson said: “The ‘in work progression trials’ helped encourage claimants to increase their hours, seek out progression opportunities and take part in job-related training. Apart from the DWP , anyone anywhere believe that UC , as it is , is a good product ? If a car , even British Leyland would have been embarrased to even design such a model let alone put it into production ? At Street Level , where would hundreds of thousands go without Trussells and others stepping into the void ? McVey admits some people will be worse off on universal credit despite counter claim from No 10 - Politics live. If somebody is telling the truth , somebody else must be lying ? There again , in politics , both will be telling the same half truth ... or half lie ??? 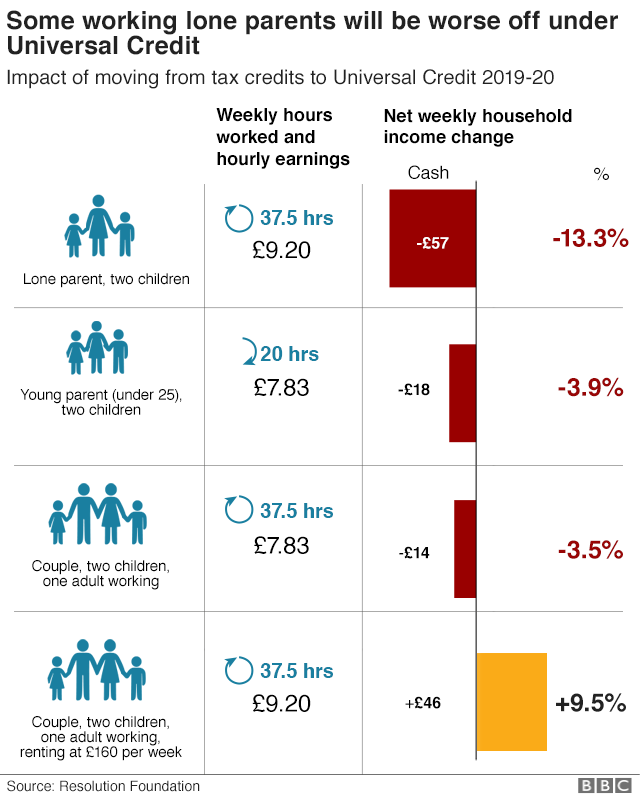 Universal credit : welfare secretary admits some families will be worse off. Esther McVey remark contradicts No 10’s and comes after John Major warned of poll tax-style backlash. The work and pensions secretary, Esther McVey, has admitted some families will be “worse off” under universal credit, after a warning from Sir John Major that the controversial welfare overhaul could end up being as damaging as the poll tax. Her comments contradict what Downing Street has said about universal credit this week, after it was reported that McVey told a cabinet meeting that half of lone parents and about two-thirds of working-age couples with children would lose the equivalent of £2,400 a year. The prime minister’s spokesman has since said no one would lose out as they moved on to universal credit. On Thursday, Major became the latest grandee to launch a fierce attack on the flagship benefits scheme, saying it could do as much damage to the Conservative party as the 1980s poll tax backlash among voters. While Major said he supported the logic behind the welfare changes, which are to be introduced for 3.95 million more people from July, he questioned whether they were workable in practice. The former Labour prime minister Gordon Brown urged the government on Wednesday to abandon the full national rollout, suggesting Britain was otherwise on course for a summer of discontent and poll tax-style chaos. Major told the BBC: “I don’t oppose the principle of universal credit, [but] I think there is a real danger that it will be introduced too soon and in the wrong circumstances. The former prime minister, who entered Downing Street in November 1990, nine months after rioting broke out in London over Margaret Thatcher’s doomed poll tax, denied he was predicting civil unrest. The Labour leader, Jeremy Corbyn, whose party advocates scrapping the policy in its entirety, said the “experience of universal credit has been that the majority of people are considerably worse-off”. The shadow chancellor, John McDonnell, and the archbishop of Canterbury, Justin Welby, have also called for the scheme, the most radical changes to welfare since the second world war, to be scrapped. Iain Duncan Smith, the former work and pensions secretary and the architect of the scheme, claimed it was working well and that thousands of people would find themselves better off in work. However, he admitted there was an issue with the policy as a result of £2bn taken out by the government in 2016, a move which prompted his resignation from the cabinet. If readers HAVE been paying attention , most will already know that many will be worse off under UC. More than one posting earlier in this thread reveals precisely that. Charities working with Universal Credit claimants required to " Sign contracts to protect Esther McVey's reputation. " Department for Work and Pensions denies they are " Gagging clauses. " At least 22 organisations - covering contracts worth £1.8 billion - have been required to sign the clauses as part of their involvement with programmes getting the unemployed into work, The Times reported. Officials at the Department for Work and Pensions (DWP) denied they were "gagging clauses" intended to prevent criticism of ministers or their policies, insisting they were just "standard procedure". However a spokesman confirmed that the contracts did include references to ensure both parties "understand how to interact with each other and protect their best interests". The signatories to contracts must undertake to "pay the utmost regard to the standing and reputation" of the Work and Pensions Secretary, the newspaper reported, adding that they must "not do anything which may attract adverse publicity" to her, damage her reputation, or harm the public's confidence in her. A DWP spokesperson said: "It's completely untrue to suggest that organisations are banned from criticising Universal Credit. As with all arrangements like this, they include a reference which enables both parties to understand how to interact with each other and protect their best interests. "This is in place to safeguard any commercial sensitive information for both government and the organisation involved." Even more fuel for the fire ? Millions to lose £52 a week with universal credit, report shows. Pressure on chancellor to announce increase in benefit funds in budget. Struggling homeowners, working single parents and the disabled will be among the hardest hit under the government’s new benefits system unless urgent action is taken in the budget, Theresa May has been warned. 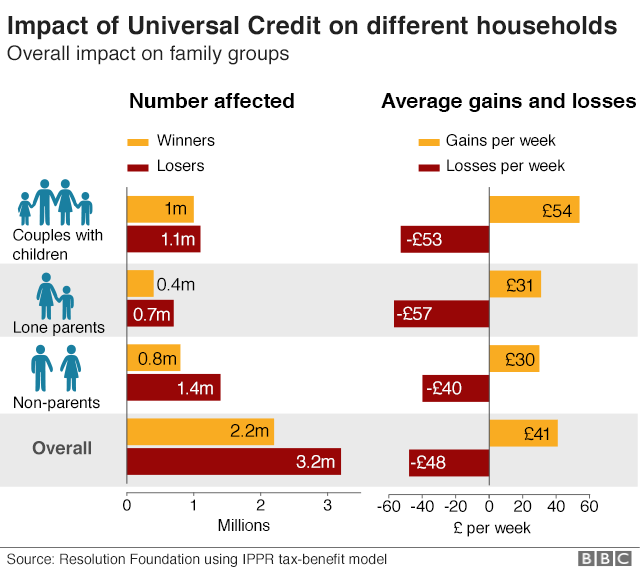 A comprehensive analysis of the impact of universal credit, compiled by the Policy in Practice consultancy and shared with the Observer, found that almost two in five households in receipt of benefits would lose an average of £52 a week. They include a million homeowners currently receiving tax credits, 750,000 households on disability benefit and some 600,000 working single parents. The scale of the impact on vulnerable groups will intensify a growing Tory rebellion, with those involved already believing they have forced a rethink. Some Conservative MPs are threatening to block the future roll-out of the system unless billions are pumped into it. In essence , to restore incomes to 2008 level , Our Phil will need a Budget of biblical proportions ... a flood of money to put the very worst climate change prediction to shame. Can be done ... printing money ... Quantum Easing ? ... BUT ... at a price ... INFLATION !
" 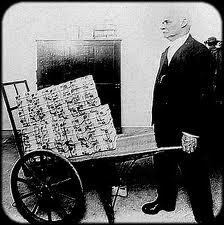 Just off to the bakers dear ... to buy a loaf of bread. " Loading the burden of austerity on to low-income parents and their children is morally reprehensible. Universal credit rollout to be 'delayed' once more, reveals leaked documents. Revelation comes after Esther McVey admitted some claimants could be 'worse off' when they switch from legacy benefits to universal credit. Had to smile ... too many casaulties after that steamroller has visited various manors ? Call a temporary halt but ... what of the devastation left behind ? The Guardian view on welfare shambles: ministers must be accountable. Tory politicians have become adept at using alternative facts to evade responsibility for the gigantic mess in welfare policy. Unless errors are recognised, they cannot be learned from. The Conservative overhaul of welfare is a chronicle of a tragedy foretold. It was never plausible that untested schemes so large that they could be seen from space would allow billions to be cut from benefits without causing pain to the poor. Yet ministers have persisted with the idea that they could do so. It is a narrative that allowed them to evade rational debate by using different facts. This is why Tory ministers say silly things, such as that food bank users typically use them because of a cashflow problem rather than poverty. It might explain why welfare ministers were not willing to act on the evident disaster of their flagship sickness benefit changes. On the kindest reading, they discounted critics as merely carping. Yet ineptitude and a culture of indifference means the government will now have to find more than £1.7bn in backdated payments to welfare recipients. This is five times the amount it had expected to pay out. It will see 180,000 people receive an average of £5,000 in compensation and claimants be paid £700m in higher benefits. The scale of human hardship this suggests is staggering. The blame rests squarely with Tory ministers. In 2011 the government, in one of its big-bang welfare changes, began moving people from older-style benefits to the new employment and support allowance (ESA). The Department for Work and Pensions proceeded with the conversion but did not check, as legally required, that claimants were receiving the right level of benefit. Although mistakes were being picked up in 2013 there was a lack of urgency in tackling the error. Incompetence allowed the problem to grow. There was an unwillingness to listen to experts. It was six years before the department began to address the mistake. It has taken eight years for ministers to come clean about the gigantic dimensions of their error, despite critical reports by the National Audit Office and parliamentary committees. The work and pensions secretary, Esther McVey, did not even turn up in person on Thursday to explain the shambles to MPs. Instead, her deputy stepped up with a claim that ministers had been “utterly transparent … about this error”. That is untrue. The government had not said anything about it until last year. Ms McVey has already been reprimanded for misleading parliament over the Tories’ biggest welfare shake-up, universal credit. Her indifference to facts borders on the insolent. Ms McVey’s speech to the Tory party conference attacked “fake news” of benefit cuts yet two weeks later she was briefing the cabinet of £200-a-month cuts to families on universal credit. Those changes are at a make-or-break moment. Unless the lessons of the ESA debacle are learned, universal credit claimants might be left out of pocket by far more than the cabinet minister is prepared to admit. Despite overseeing monumental failures, Ms McVey remains in post. Mendacity in welfare allows Tories to evade engagement with facts. This needs to stop. Without facing up to mistakes, one cannot learn from them – and in welfare it is the poorest who will pay. Not much more to add to that ? Why don't the tories do the decent thing (what am i saying ) and just scrap universal cockup ? Scoreboard from a war zone ? Universal Credit in numbers: Shocking stats show food and fuel poverty in the North East. Figures suggest the North East's most vulnerable are being failed by the system designed to help them. Shocking figures have revealed the full extent of the impact of controversial welfare reforms on Newcastle’s most vulnerable. New data compiled by Newcastle City Council shows how food and fuel poverty has risen amid the introduction of government reforms including Universal Credit and the bedroom tax. There are now more than 17,000 benefit claimants in Newcastle that have been moved over to Universal Credit, which local authority bosses estimate will slash income from working age benefits in the city by almost £130 million a year by 2022. The council handed out 2,255 payments totalling £1,169,857 in 2017/18 from a hardship fund to help people meet their housing costs — compared to just 203 Discretionary Housing Payments in 2010/11, with a total value of £88,563. In 2017-18, West End Foodbank’s food parcels fed 21,000 residents, with half of all food parcels distributed going to households with children. The Lilia Centre also provided 5,800 hot meals. Levels of fuel poverty in the North East are higher than average at 13.8%, and higher again in Newcastle at 14.4% - equating to approximately 17,268 city households. As Universal Credit has been rolled out, Newcastle City Council’s Energy Services note an increase in the number of households who have ran out of money and can’t afford to top up prepayment meters. There were 136 such reported cases in 2017/18, up from just 21 the year before. During 2017-18 the council made 813 food awards - for Asda food delivery, Tesco food vouchers or dried food from a food store. During the same period, 1,014 awards were made for fuel vouchers for households that did not have gas or electricity. As of April 30 this year, there were 2,991 households still affected by the bedroom tax in Newcastle, losing an average of £13.72 per week. Coun Joyce McCarty, Deputy Leader of Newcastle City Council, said: “The government’s welfare reforms are the biggest post-war change to the welfare state. These changes and the resulting loss of income are contributing to increased pressure on the council and its partners. “In Newcastle it is estimated that these changes will mean £129m of annual cuts to income arising from working-age benefits for up to 40,000 residents by 2023. “This creates a further need to support residents despite our own resources being pushed to the brink by £283m in cuts from central government. The council report added that “the government’s vision of ensuring that “work pays” is not always that straightforward” because of the complex barriers many vulnerable people need to overcome. A DWP spokesman said: “Our reforms are helping to build a welfare system that works for those who use it and those who pay for it. Employment in the North East has risen by 70,000 since 2010, to over 1.2 million. “We’re incentivising work and restoring fairness to the system, while supporting people from all backgrounds. That’s why we continue to spend over £90bn a year on support for those who need it, including those who are bringing up a family or on a low income. The Government announced last week that it would delay the nationwide roll-out of Universal Credit, following warnings that the controversial benefit has left families unable to pay their rent and depending on food banks to eat. Coun Nick Cott, the city’s deputy Lib Dem opposition leader, said he shared the council’s concerns over poverty levels and the impact of Universal Credit. He added that the council needs to develop its mechanism for working with voluntary groups across the city to tackle poverty. Newcastle , West End foodbank.